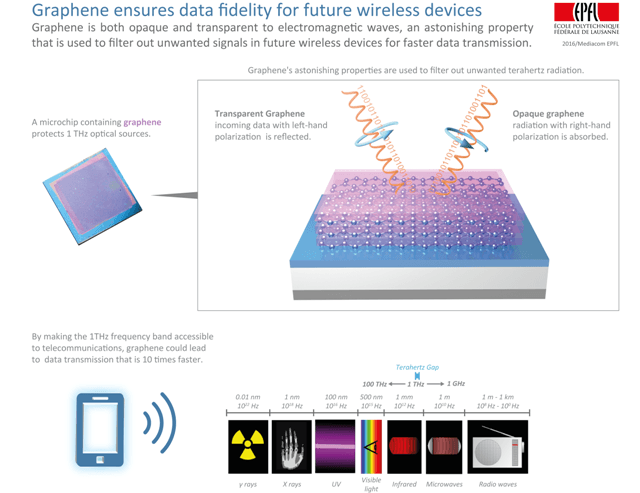 A novel graphene-based microchip, developed by a group of researchers from EPFL and the University of Geneva (UNIGE), can eliminate unwanted radiation, enabling faster wireless data transmission. According to the scientists, the discovery could help develop devices capable of performing ten-fold faster wireless data transmission than existing technologies. The study findings have been reported in the Nature Communications journal. Our graphene-based microchip is an essential building block for faster wireless telecommunications in frequency bands that current mobile devices cannot access. In this microchip graphene behaves like polarized sunglasses and protects wireless data sources, which are essentially invisible radiation sources, by filtering out unwanted radiation. This reduces the source corruption, and a result, the data remains unaffected. As the orientation of the vibration is different for each radiation, the graphene-based microchip only allows radiation that vibrates in a specific manner to pass through. This causes graphene to become both opaque and transparent to a particular radiation, based on the signal direction and orientation of the vibration. Using this property, the researchers created a device called an optical isolator. The microchip operates in the terahertz gap, a frequency band which is now empty. The operation of existing wireless devices involves data transmission at optical frequencies or at the gigahertz range. Researchers have to address a number of technological challenges to exploit the terahertz band for data transmission, making the technology currently unfeasible. However if it is possible to apply this terahertz bandwidth in wireless devices, future mobile phones will be able to achieve a ten-fold faster data transmission. This means faster uploads, better sound quality, and superior image quality. The graphene-based microchip is a step closer to realize the practical applications of this terahertz technology. This breakthrough device helps to address a key challenge that remained unsolved until now due to the lack of technology, highlighting the exotic physical properties of graphene. The European Graphene Flagship project and the Swiss National Science Foundation funded this research work.